Original Editors Mary Harris, Tom Lawlor, Patrick Bales, Misty Hillin, Rick Wetherald as part of the Texas Evidence Based Practice Project. 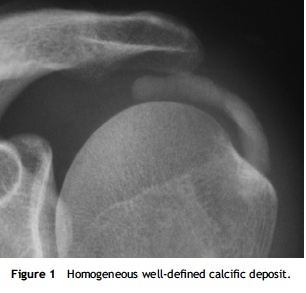 Calcific tendinopathy, or "calcium hydroxyapatite crystal deposition disease”, refers to the deposition of calcium—predominantly hydroxyapatite—in a tendon, most often in those of the rotator cuff. It may be secondary to a local decrease in oxygen tension resulting in fibrocartilaginous metaplasia and resulting calcification. Hypovascularization, but has been removed from both poorly and well-vascularized tissues. Calcific tendinopathy occurs in 2.5%–7.5% of healthy shoulders in adults, and 39-62% of those being seen in medical centers for shoulder pain. It's more commonly seen in women (70% of cases) and most frequently during the 5th decade of life, but has been seen in a 3 year-old and a 72 year-old.. Right shoulder is more frequently affected but there is no evidence to support predisposing factors. Asymptomatic: appear granular or cheesy, and have sharply defined borders. Symptomatic: enlarge, liquify, and have less well-defined borders. "dry powder", "chalk-like", "semi-liquid toothpaste", "milky" and "creamy"
Calcific tendinopathy is a self-limiting condition. Symptoms may last several days or become chronic; there is no clear prediction of disease course. Time required for symptoms to disappear is typically too long for patient’s QoL. The typical clinical manifestation is a sub-acute, low-grade shoulder pain that increases at night (50% of patients), with restricted range-of-motion. is asymptomatic and may be so for years. 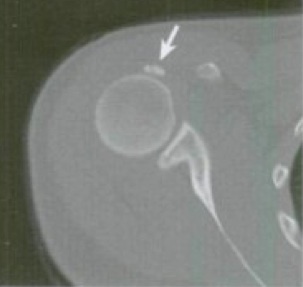 As Calcific tendinopathy is a soft tissue injury that can only be conclusively diagnosed via imaging, it is important to rule out other shoulder pathologies. It is recommended that the initial images include the anteroposterior view in neutral, internal, and external rotation. Imaging will provide definitive proof of calcific build-up through what appear to be “bone spurs”. An ultrasound image of the area is also advised, as this will rule out or rule in any differential diagnosis of soft tissue injuries such as a rotator cuff tear . 20-46.4 % of all cases are bilateral in nature, so all images and examinations should be conducted in a bilateral fashion , . Only 35% of cases are symptomatic, so bilateral imaging and examination can detect calcified deposits in an asymptomatic shoulder, if one side is already experiencing calcific tendinitis. This can help to guide treatment and decrease possible patient expenses and future visits. Since imaging is the only way to diagnose calcific tendinopathy, physical examinations will seek to rule out a condition rathar than to rule in a condition. Several systemic diseases are associated with an increased risk of calcification, such as gout, hypercalcemia of any cause, and various rheumatic diseases, . 1.) Night pain, causing loss of sleep., , , . 3.) Pain increases considerably with AROM. 4.) Decrease in ROM, or complaint of stiffness , , . 5.) Radiating pain up into the suboccipital region, or down into the fingers, , . • Observation-check bilaterally for swelling, atrophy or scapular movement that will indicate compensation for decreased humeral movement. • Palpation-attention to any swelling, temperature difference, point tenderness. Most specifically, the supraspinatus tendon, as it is the most commonly affected. The infraspinatus, teres minor, subscapularis, and biceps tendons are also involved and follow in incidence in the afore-mentioned order. • Neuro and cervical screen may be indicated as N&T, or radiating pain may be present. • AROM and PROM-pain and decreased ranges may be present in any, or all planes (depending on tendon(s) involved). Observe end feel, may be empty 2˚ to pain. • MMT’s-may demonstrate decrease from contralateral side or be limited by pain. Most current medical treatment approaches for calcifying tendinopathy involve removal or downsizing of the calcium deposit(s). This is usually accomplished by excision or surgery, or by attempting to activate the body’s natural calcium resorption processes. First line treatments, especially in primary care offices, are most often non-steroidal anti-inflammatory drugs, or possibly local steroid injections. These treatments are done with the goal of decreasing pain and inflammation, but there is little evidence that they promote resorption of the calcium deposits. In fact, some researchers believe steroid drugs may actually inhibit the resorption process . There is evidence supporting the use of extracorporeal shock wave therapy (ESWT) as a potentially effective treatment of calcific tendinopathy. The modality administers high frequency sound waves to the affected area with the intent of breaking up the calcification. Researchers claim that this will cause the body to activate or increase the body’s calcium resorption system, removing the deposit. Depending on the frequency used, the treatment can be painful, but research shows the modality to be most effective at the highest frequency the patient can tolerate.ESWT is a potential alternative to surgery with good mid-term effectiveness and minimal side effects. But ECSW is not free from complications, that included transient bone marrow edema and even reported cases of humeral head necrosis. Shock wave therapy increases shoulder function, reduces pain, and is effective in dissolving calcifications. These results were maintained over the following 6 months. Patients presenting with previously diagnosed calcific tendinopathy may have had medical treatment prior to PT. Limited research exists showing good short and long-term outcomes using an impairment based approach following medical treatment (aspiration or excision). These PT treatments were similar to treatment for adhesive capsulitis or rotator cuff impingment, including PROM/AAROM/AROM, capsule stretching and isometric activation of the affected rotator cuff musculature. Grade II-IV glenohumeral anterior-posterior and caudal glides should also be used when applicable restrictions are found. Lam et al 2006 is a concise evidence summary encompassing most of the research surrounding diagnosis and medical management of calcific tendinopathy. The article outlines indications and contraindications of popular treatment approaches, and gives a thorough explanation of each procedure. There are also helpful radiographs of different types and stages of the pathology. Wainner & Hasz 1998 is a case study that provides a concise explanation of the pathology as it applies to physical therapy practice. It outlines classification of stages of calcific tendinopathy based on pain and physical exam findings, and also highlights how the combination of orthopaedic and physical therapy management can expedite the healing process. Calcific tendinopathy is a comparatively common disease with an incidence between 2.7 and 7.5% and minority of cases are symptomatic3. Its unknown etiology and impact on quality of life and function are just two reasons it requires further research. A thorough physical examination and patient history review can only help to distinguish it from other pathologies with a similar presentation as imaging is the only definitive diagnosis. Since the condition will often present as a number of other pathologies, treating calcific tendinopathy with traditional therapy, based on a wrongly hypothisized pathology may result on little to no improvement of symptoms. If this situation presents in the clinic, imaging must be ordered to rule out calcific tendinopathy. Current best evidence suggests that shockwave therapy has benefits to reabsorption of the calcific deposit. Impairment based therapy is still believed to be of greatest benefit through increasing blood flow to allow the bodys natural reabsorptive processes to work. ↑ 2.0 2.1 2.2 2.3 2.4 2.5 Serafini G, Sconfienza L, Lacelli F, Silvestri E, Aliprandi A, Sardanelli F. Rotator cuff calcific tendonitis: short-term and 10-year outcomes after two-needle us-guided percutaneous treatment--nonrandomized controlled trial. Radiology [serial online]. July 2009;252(1):157-164. Available from: CINAHL Plus with Full Text, Ipswich, MA. Accessed September 20, 2011. ↑ 3.0 3.1 3.2 3.3 Lam, F, Bhatia, D, K, J.F. de Beer. Modern management of calcifying tendonitis of the shoulder. Current Orthopaedics; 2006, 20, 446–452. ↑ Siegal D, Wu J, Newman J, Del Cura J, Hochman M. Calcific tendinitis: a pictorial review. Canadian Association Of Radiologists Journal [serial online]. December 2009;60(5):263-272. ↑ 6.0 6.1 Loew M, Sabo D, Wehrle M, Mau H. Relationship between calcifying tendinitis and subacromial impingement: a prospective radiography and magnetic resonance imaging study. Journal Of Shoulder And Elbow Surgery / American Shoulder And Elbow Surgeons ... [Et Al.] [serial online]. July 1996;5(4):314-319. ↑ 7.0 7.1 7.2 7.3 7.4 7.5 7.6 Gimblett P, Saville J, Ebrall P. A conservative management protocol for calcific tendinitis of the shoulder. Journal Of Manipulative And Physiological Therapeutics [serial online]. November 1999;22(9):622-627. ↑ Takahashi M, Ogawa K. Calcific tendinitis of the rotator cuff showing a contracted state of abduction: a report of four cases. Journal Of Shoulder And Elbow Surgery / American Shoulder And Elbow Surgeons. January 1997;6(1):72-76. ↑ Rapp S M. With few advances in calcific tendinitis treatment, diagnosing it becomes critical. Orthopedics Today. 2008; 70. ↑ 10.0 10.1 Fusaro I, et. al. Functional results in calcific tendinitis of the shoulder treated with rehabilitation after ultrasonic-guided approach. Musculoskeletal Surgery. 2011 (95): S31–S36. ↑ 11.0 11.1 11.2 Ebenbichler G R. et. al. Ultrasound therapy for calcific tendinitis of the shoulder. New England Journal of Medicine. 1999; Vol 340 (20): 1533-1538. ↑ 12.0 12.1 Alexander L D., et. al. Exposure to Low Amounts of Ultrasound Energy Does Not Improve Soft Tissue Shoulder Pathology: A Systematic Review. Physical Therapy. 2010; vol 90 (1): 14-25. ↑ 13.0 13.1 Uhthoff HK, Sarkar K. Calcifying tendinitis. Rockwood Jr CR,fckLRMatsen III FA, editors. The shoulder, vol. 2. Philadelphia: WBfckLRSaunders; 1990, 774–90. ↑ Neer CS. Anterior acromioplasty for the chronic impingementfckLRsyndrome of the shoulder. J Bone Joint Surg (Am) 1972;54A:fckLR41–50. ↑ Resch H, Povacz P, Seykora P. Excision of calcium deposit andfckLRacromioplasty? In: Gazielly DF, Gleyze PTT, editors. The cuff.fckLRParis: Elsevier; 1997. p. 169–71.